2017 has been a fabulous year for sports lover. The first ten months gave us more than we could have ever asked for when the year began. From Anthony Joshua’s defense of his title, to the McGregor-Mayweather fight, and Real Madrid breaking the jinx to win the UEFA Champions League back-to-back, it’s been a great year. But what if we told you that the sports year’s just about to get even more interesting? Whenever the month of November comes around, it means one thing: so many sporting events to catch up with. From the NFL to the MLB and NBA in the United States to the MLS Play-offs, Formula 1 and European football, it’s usually one of the busiest months for sport lovers. 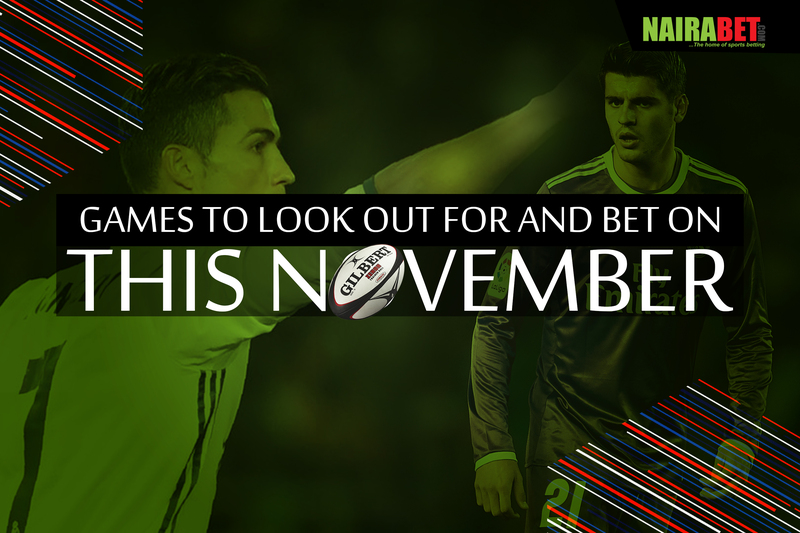 This being said, we will be looking at some of the interesting games to look out for – and also bet on – this month of November. Manchester City vs. Arsenal (Nov. 5): Pep Guardiola’s unbeaten side will test their resolve when they welcome Arsene Wenger and his gooners to the Etihad Stadium this weekend. Chelsea vs. Manchester United (Nov. 5): Jose Mourinho visits Antonio Conte and the Blues in his Gameweek 11 fixture of the PL season. Being embroiled in a tax case in Madrid, Mourinho’s preparations for this game may be affected – although he disagrees. Do you agree with Mourinho? Do you think Manchester United can shake off all the distraction and hand Conte a second defeat in a week? Arsenal vs. Tottenham (Nov. 18): After facing Manchester City, Wenger’s men will now slug things out in their derby game against London rivals, Tottenham. Liverpool vs. Chelsea (Nov. 25): Jurgen Klopp doesn’t exactly have a busy schedule like Conte does, but he will be hoping to finally get 3 points against a direct title rival after losses to Man. City, Spurs and the draw with Man. Utd. Atlético vs. Real Madrid (Nov. 19): Real Madrid started their month with a shock 3-1 loss to Tottenham. Will the misery continue when they take on Diego Simeone’s men after the international break? Valencia vs. Barcelona (Nov. 26): As of the time of writing, both sides are still unbeaten in the La Liga this season. One has depended heavily on Messi for the goals while the other has played beautiful and free-flowing football this season. Which one of these two sides will score more than 2 goals in the game? Click here to back your predictions and earn yourself some extra cash. Borussia Dortmund vs. Bayern Munich (Nov. 4): This, regardless of form and current standings, is a big game any day, a game you cannot afford to miss out on. Napoli vs. AC Milan (Nov. 19): Both sides have contrasting seasons in Italy’s premier football league. While Napoli has been hanging around with the boys at the top, AC Milan, with all the Chinese money, have chosen to stay mid-table. A Napoli win or an AC Milan win? The month of November will feature Week 4, 5, 6 and 7 of the NBA. What this means is that there will b at least five NBA games every day in November. With this kind of hectic schedule, stats get obsolete as quickly as possible. Franchise positions in both the Eastern Conference and the Western Conference change every day. As of the time of writing, Boston Celtics topped the Eastern Conference with a 6 – 2 record while LA Clippers dominated the Western Conference with a 5 – 2 record. Click here to check out the full list of basketball games this month and also back your favorite basketball team or basketball player. Which of these games are you looking forward to? Leave us a comment and let us know what you think. Cheers to a sporty November! This games are just mouth watering one’s. I just hope Arsenal will make us proud this time around by stopping Manchester City. Chelsea Vs Man U, is an unpredictable match, i won’t even include it on my ticket. #SuperSunday indeed.